It’s no secret that Instagram has become enormously popular in the Arab world, with users from Casablanca to Riyadh posting images of friends and family, diarising their days and sharing photos of their favourite things. So, we’re proud to announce Starbucks’ brand new Instagram account for the region. Thousands of coffee lovers in the Arab world visit Starbucks stores every day and we take pride in handcrafting a coffee beverage for each of them. However, we’ve noticed that as our baristas reach across the counter to deliver that perfect cup of coffee to another Starbucks customer, many customers use Instagram to share their Starbucks experience with their friends and families. Well, we have some sharing to do too! You’ll find our new Instagram profile at StarbucksMiddleEast, where you’ll be able to follow Starbucks images posted from around the Middle East and North Africa. We’ll be taking photos of our people and operations in the region, plus giving you an exclusive glimpse of new Starbucks initiatives in Instagram’s stylish format. We’re also keen to see more of your Starbucks moments on Instagram, so please connect with us and share your Starbucks Special Moments with us. To help us celebrate the launch of Starbucks MENA on Instagram, we’ve asked Kuwaiti artist and designer Ahmed AlRashid, to create a new Starbucks coffee cup design. Ahmed is an old friend of Starbucks and has created some stunning coffee cup graphics for the region in the past, including designs for the launch of the Starbucks Middle East Facebook page. He has a unique take on how to re-conceptualise traditional art and create modern design work from it. He’s also a bit of an Instagram fan, posting his work and inspiration on Instagram – and even selling some of his designs via Instagram too! So, Ahmed was our first choice to help support in the StarbucksMiddleEast Instagram launch. 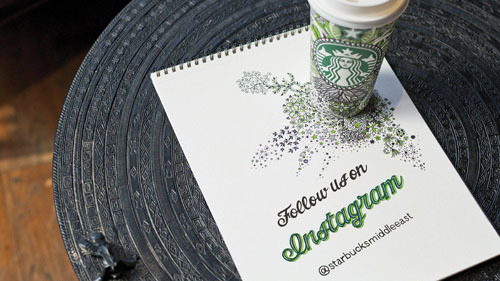 Look out for his new Starbucks designs in our Instagram timeline!